Buy 2019 Canadian Silver Maple Leaf coins from Universal Coin & Bullion. 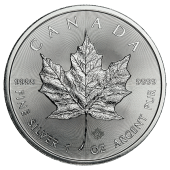 When Canadian Silver Maple Leaf coins were originally issued by the Royal Canadian Mint in 1988, they became the world’s first 99.99% pure silver coin. Today, they are one of the most popular .9999-fine silver coins. Their weight, content, and purity are guaranteed by Her Majesty’s Government of Canada, a constitutional crown monarchy among the British Empire Commonwealth of Nations. 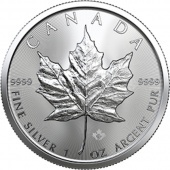 2019 Canadian Silver Maple Leaf coins, like American Silver Eagles, contain one full Troy ounce of silver. These coins are also legal tender and carry a face value of five Canadian dollars. The obverse of the Canadian Maple Leaf bears a portrait of Her Majesty, Queen Elizabeth II, who has reigned from the British throne since 1952 and is the Queen of Canada. The reverse of the silver Canadian bullion coin bears its namesake Maple Leaf design, an enduring patriotic symbol of Canada. Canadian Silver Maple Leaf coins evoke vast stretches of natural beauty. Natural woodlands. Majestic creatures. Bullion-rich Yukon lands. Old World European heritage. Unbounded wilderness. Any red-blooded American would be proud to own Canadian silver Maple Leaf coins, a solid investment for today, a promising stake in the future for tomorrow. Government Backing – Each Silver Maple Leaf coin is guaranteed by Her Majesty’s Government. Historic Heritage – Maple Leaf silver coins come from our good neighbor, the Great White North. Investment-Grade Silver – Each coin contains one full Troy ounce of .9999-fine silver. A Solid Investment – Investors trust Canadian Silver Maple Leaf coins. Highly Liquid – It’s easy to sell the popular Maple Leaf Silver coins throughout the United States. What will tomorrow bring? Only God knows. But you can ensure your future is as secure as possible when you include 2019 Canadian Silver Maple Leaf coins in your precious metals IRA. Investing in IRA-eligible silver bullion coins like the Canadian Silver Maple Leaf is ideal for Americans who desire owning solid wealth – real, pure silver backed by one of the world’s leading governments. Legal-tender Canadian Silver Maple Leaf coins are monetized, so they’re desirable for stacking, spending, and collecting. This makes them a highly liquid asset. Canadian Silver Maple Leafs are as widely recognized both here and abroad, so they’re easy to sell virtually anywhere, anytime. No wonder Canadian Maple Leaf silver coins are sought-after the world over! You want to spend your hard-earned money wisely, which is why you should buy your silver investments from Universal Coin & Bullion – one of the most trusted names in the bullion industry. When you buy your silver coins from Universal Coin & Bullion, you can rest assured they have been authenticated and approved by renowned bullion expert Dr. Michael Fuljenz and his trained staff of numismatic investment professionals. Dr. Fuljenz, who has more than 40 years of coin grading and authentication expertise. He has also won numerous prestigious awards from leading numismatic and consumer advocacy organizations. Each coin you buy from Universal Coin & Bullion is backed with a 100% satisfaction guarantee and expert quality assurance. Nothing beats such peace of mind. For more information on 2019 Canadian Silver Maple Leaf coins, call an account representative today at 800.822.4653. Canadian Maple Leaf coins were first struck in 1988 near the dawn of the modern bullion coin era. 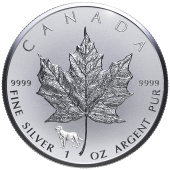 One of the earlier world bullion coins still available from its issuing mint, the Canadian Maple Leaf offers the security of government-backed .9999-fine silver bullion, the artistic beauty and precision of the Royal Canadian Mint, and the incredible liquidity of a Western-minted bullion coin with a highly recognizable design. The obverse of the Canadian Maple Leaf coin depicts a right-facing effigy of Queen Elizabeth II, who has served as Queen of Canada since her ascension to the Royal British throne in 1952. The reverse portrays a sugar maple leaf, with the inscription CANADA above. Since 2015, Maple Leaf coins have included highly secure micro-laser engraved radial lines and a small maple leaf image to below the main device to help combat counterfeiting. Silver Canadian Maple Leafs have been struck since 1988 – nearly a decade after the initial release of Canada’s gold Maple Leaf coins. The silver and gold Maple Leaf coins are regarded by investors as some of the safest bullion coins on the market and are widely traded throughout North America and abroad. To buy your 2019 Canadian Silver Maple Leaf coins and Gold Maple Leaf coins, call 800.822.4653 today. Be sure to ask about our other popular coins and bullion investment products, including American Silver Eagles, Carson City Morgan silver dollars, Perth Mint silver coins, and much more.